Sometimes I think the only reason I have cable is to watch the Food Network. All weekend long I have the TV on as I do my cooking and cleaning. Ina Garten, Laura Calder and Bobby Flay are like the soundtrack to my weekend. I’m not a huge fan of competition shows in general but one of my favourite cooking shows is Top Chef, which in Canada airs on Food Network Canada a few weeks after it begins in the United States. I love watching chefs come up with incredible (and sometimes terrible) meals, and seeing their creativity grow each week. I would also love to know the truth about the pea puree. Unfortunately, I got my December issue of Food and Wine before the finale aired in Canada, so despite all my efforts to live in a bubble, I knew who was going to win. All this to say these cookies are from Food and Wine’s feature of Kevin Sbraga. The cookies all looked delicious, but I decided the first one I had to try was the chocolate biscotti. My dad makes biscotti every Christmas, but I had never made them myself. The batter is just as easy to put together as a sugar cookie. The only real difference is the baking process. First the cookies are baked as a log, the log is then sliced and the pieces are baked again until they dry out. These biscotti were very tasty. The chocolate and pistachio go together very well, but to be honest with you, I prefer my dads. Just because. Preheat the oven to 350. Line a baking sheet with parchment or a silpat. Cream butter and sugar together until light and fluffy. Add the eggs, vanilla, and rum beating until well combined. In separate bowl stir together the flour, cocoa powder, baking powder and cinnamon. Mix the dry ingredients into the wet. Beat in the pistachios. Divide the dough in two, shape each half into a log. Brush the logs with the egg whites. Bake for 25 minutes. Remove from the oven and let cool slightly. Cut the logs into slices, return to the oven and bake for an additional 20 minutes until the cookies have dried out. Let cool completely. Drizzle with melted chocolate. I really like this recipe with the scraped vanilla bean, too bad my husband ate my bag of shelled pistachio nuts, oh well, another trip to the store! Love biscotti. 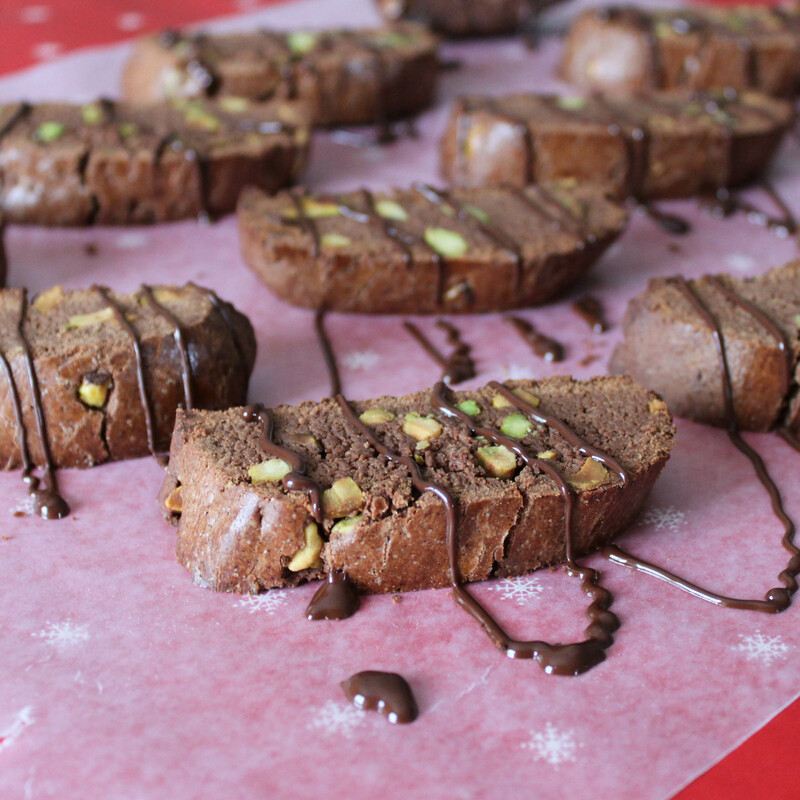 And chocolate with pistachio biscotti. That’s triple love. Love those…you did fantastic job! Nicely done! I’m not the biggest fan of competition shows either (other than food network challenge – love that show) – they make me stressed out! Especially Iron Chef – I think I’m too fragile to watch that show. All the frantic-ness of that show gets to me. This biscotti looks great. Pistachio is probably my favorite nut! Biscotti are pretty easy, once you have made them once you realize they aren’t as hard as they seem. Yours look wonderful, all chocolately and delicious! I’d like one to dip in my coffee right now. YUM. My coworker made me some chocolate biscottis last year for CHristmas and they were wonderful. I love that you used pistachios… brilliant! Love the pistachios! Taste great and look amazing, great job! Fabulous biscotti :) I find myself watching too much Food Network sometimes but I’m a glutton for Top Chef (which ironically is not on Food Network in the states) and love watching great minds like that at work! This biscotti though.. I could totally see myself dunking this in a good cup of coffee! Yeah, I really don’t understand why Top Chef isn’t on Bravo in Canada. Yum! These look and sound delicious! Biscotti is a holiday traditional at my grandmother’s house, though it is usually store-bought. I may have to try these out soon to get that holiday spirit here in France! À bientôt! chocolate biscotti what a treat, love it! Thanks, Lynn! I have to be honest I wasn’t so impressed with the December 2010 issue of Food & Wine but these do look really good! Pingback: Cream Puffs In Venice - Magazine Mondays: The Last One for 2010! These look super! I bet they were delicious! Love the choc/pistachio combo–a real winner!! First of all, sorry Food & Wine blew it for you by announcing the winner. That is sooooo rude. The finale is the best part of Season 7 though, and I’m sure you’ll still enjoy it if you haven’t seen it already. I made these cookies too. I was disappointed. I felt that the recipe was flawed. Too much flour for one thing. I’ve forgotten my other issues with the recipe…but I’ve had much better chocolate biscotti. Still, I will try Kevin’s lemon sandwich cookies from the same article. They look heavenly.